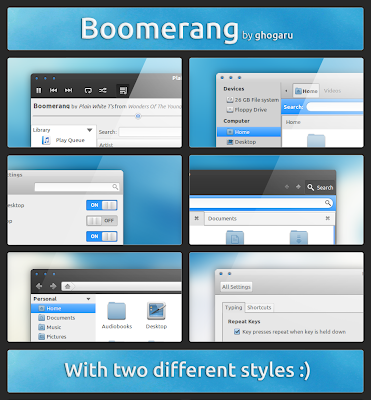 Boomerang is a set of two cool GTK3/GTK2 themes by ghogaru. These themes support both Unity and Gnome Shell and come with dark panel/menu and light panel/menu variants. Now just grab the theme pack from here and extract the archive into usr/share/themes. You can use Gnome Tweak Tool to switch themes. Follow the instruction below to fix the panel background in Gnome 3 Classic Session. 1. ALT + Right-click on the panel and select properties. 2. Click on the 'Background' tab and select the option 'Background image'. 3. Set the 'panel_bg.png'/'panel_bg_dark.png' (included in the archive) as the background image. If you are using ArchLinux or Fedora, you can find installation instructions in INSTALL file included in archive.